In a world of NEW and NOW, we remain humbled by the pea-sized garnet that took millions of years to form. The Wishing Stone is a nature discovery store. From our carefully curated sterling silver and gemstone jewelry selection to our alphabetized apothecary of healing stones, from our lit showcases full of collectible mineral specimens to the tactile playground of stacked shelves and rock bins at the back of the shop — we've worked hard to make our brick and mortar storefront an adventure for our customers! We are art collectors, students, and teachers. Store owner Janet Yoshikawa is a gemologist, former GIA instructor, and art school graduate with a lifelong appreciation for natural wonders and oddities of all kinds. Founded in 2001, The Wishing Stone began as a little seaside boutique in Mukilteo, Washington. In 2005, the store moved to Main Street in Edmonds, Washington. Here, Janet met Mark, who also ran a retail rock shop for many years. His mining, dealing, and lapidary skills now advise our mineral inventory. With a staff of dedicated nature-lovers (and friends! ), we grew and learned. In 2014, The Wishing Stone relocated the Edmonds store to a bigger unit up the street. We also enjoyed operating a store at Seattle-Tacoma International Airport for four years. 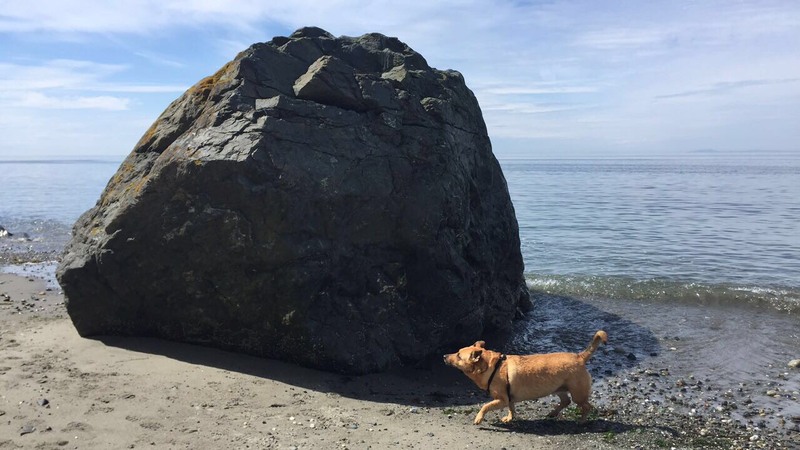 Smokey's favorite rocks are the size and color of a tennis ball.